Unlike many traditional dog sports, herding is a world unto its own. You picture your dog quietly gathering the sheep in response to your whistled directions, he gives them the "eye" and then runs the sheep toward you stopping just as the sheep reach your side. Ahhhh! This is Herding!! Then reality sets in. You go to a class and herding is filled with terms you never heard in the "regular dog world". You are told you are stepping in your dog's eye even though you are 10 feet away. The word "pressure" takes on new, and very important, meaning. Sheep run amok and ducks take flight while your dog dashes around like a madman ignoring your commands. You can't think fast enough and your dog can't slow down. Discouraged, you head for home and go back to more traditional sports like agility. At least the a-frame doesn't move in the middle of a class! And heck, everyone understands what a tunnel is!. But herding does not have to be that way! 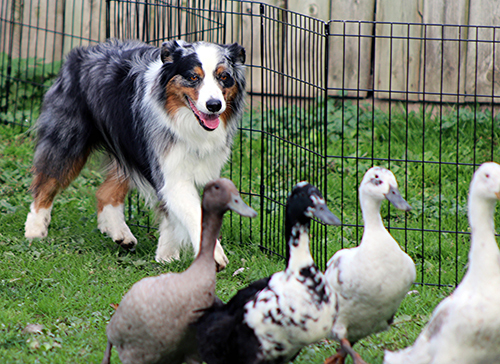 Our one day clinics are designed to introduce you to the Wonderful World of Herding. Commands are explained and the desired actions are demonstrated. Herding is put into perspective from the dog's point of view by having the handler work the stock. Tools are explained and attendees learn how to use them. Dry work, a concept honed to perfection at Tee Creek, is demonstrated so that students can then go home and teach their dogs everything they need to know before ever stepping foot into the herding field. It does not matter if you live in Toronto you and your dog can practice your "away to me" at home. Best of all, at Tee Creek they not only know how to train "other breeds", they own them! No dog is expected to work like another dog and there are no "cookie cutter" training methods used. Students who use food or toy rewards as part of their normal training will be happy to see that the dry work is taught by using these familiar rewards. Handlers are encouraged to combine their own training techniques with the dry work to best utilize any strengths they have built up as a team with their dogs. So if you are thinking about herding or have started herding and find yourself lost, come to a One Day Clinic with Kathy Warner and unlock the mystery of Herding! To return to Tee Creek's Main Site, please close this window.